How your smile looks is important. How your smile functions is even more important. With dental implants from Robison Dental Group, our doctors can help you with both. 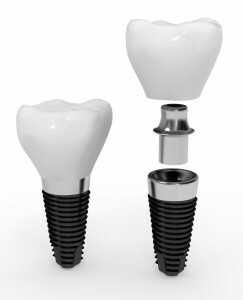 Dental implants are similar to traditional restorative options like crowns, bridges, and dentures, but one thing sets them apart and makes them more effective. Unlike traditional options, which just replace your missing tooth (or teeth), dental implants replace your missing tooth and your missing root. Because when you lose one or more tooth roots, parts of your jawbone that used to serve a specific purpose don’t any longer. As a result, those parts will begin to lose bone mass. Over time, that loss of bone will spread, potentially resulting in further tooth loss. But with dental implants, you can restore your smile and preserve your jaw thanks to the interaction between your implants and your jaw. Dental implants are made from biocompatible titanium, which bonds with bone tissue, creating a strong, natural foundation for your new smile. To restore your smile with dental implants, though, you have to be a candidate for the implant procedure. You can find out if you’re a candidate by scheduling a consultation with our Canton dental office. During your appointment with us, one of our doctors will thoroughly examine your smile and make a decision based on your situation, your needs, and your medical history. Call Robison Dental Group today if you’re ready to schedule your visit with us. We restore smiles from Canton, Ann Arbor, Northville, Plymouth, and beyond.